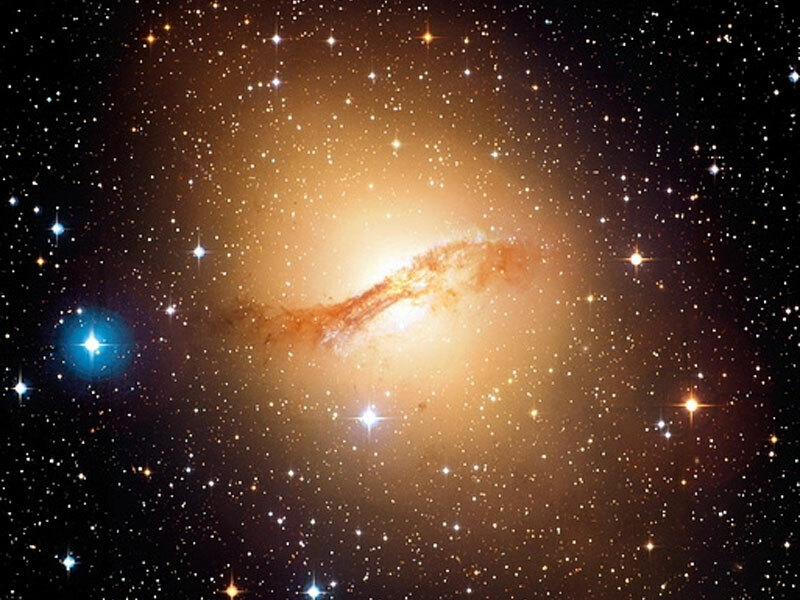 Explanation: Why is peculiar galaxy Centaurus A so dusty? Dramatic dust lanes that run across the galaxy's center mark Cen A. These dust lanes are so thick they almost completely obscure the galaxy's center in visible light. This is particularly unusual as Cen A's red stars and round shape are characteristic of a giant elliptical galaxy, a galaxy type usually low in dark dust. Cen A, also known as NGC 5128, is also unusual compared to an average elliptical galaxy because it contains a higher proportion of young blue stars and is a very strong source of radio emission. Evidence indicates that Cen A is likely the result of the collision of two normal galaxies. During the collision, many young stars were formed, but details of the creation of Cen A's unusual dust belts are still being researched. Cen A lies only 13 million light years away, making it the closest active galaxy. Cen A, pictured above, spans 60,000 light years and can be seen with binoculars toward the constellation of Centaurus. NGC 4696: волокна вокруг чёрной дыры.